I had an interesting conversation just before my holidays about Defibrillators and people saying that they are complicated to use, they can restart hearts, and they can be only used by trained medical people, what a load of bloody C**P that is, not using one could potentially cost someone their life. If defibrillators are so complicated to use why are they available in so many public places these days, I bet you have noticed them whilst going about your daily life, you find them in secure cabinets on walls in shopping centres with a keypad to open them, I recently saw an old red telephone box that had been used for one in a sleepy village in the Cotswolds, even found one on the outside of a public house, that did surprise me and did get a smile too. The Ambulance Service know the whereabouts of all public Defibrillators that have been registered on to the system, they will give you the nearest location and will also give you the code to open the secure container and take it to the person who is having a bad day. You do NOT have to have medical training to use a defibrillator either, anyone can use one and they are designed to be simple to use. First aid courses for the workplace have defibrillator training included as standard this meets HSE and UK Resuscitation Council guidelines. Another myth is that defibrillators can restart hearts, and that’s another piece of C**P, defibrillators actually stop the heart to allow the heart to regain its natural rhythm and the defibrillator will monitor the heart and will ONLY SHOCK if necessary. 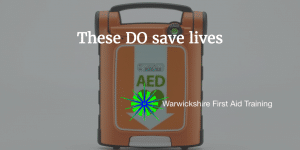 If a defibrillator is used within the first 3 minutes and the person is in a shockable rhythm the chances of that person surviving is significantly increased, although this does diminish if there is a delay in using a defibrillator. You CANNOT make the situation any worse by using a defibrillator after all the defibrillator will analyse the heart rhythm and will only shock if a shock is required. Where can I learn to use a defibrillator? First aid training providers throughout the country provide defibrillator training as standard on first aid courses in the workplace, and many have standalone courses that last around ½ a day. Child Chokes in Coffee Shop Asthma attacks are damn scary..